The energy was dynamic and positive at Homalco (Xwemalhkwu) First Nation in early January when the new chief and councillors laid out plans for the next three years. 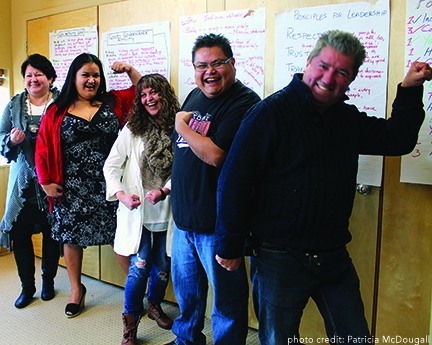 Potential priorities for the coming year included governance policy and procedures, a housing strategy, youth council as well as healing and wellness plans. Councillor Darren Blaney said, “Healing must come first”. This comment led to an avid discussion on healing within the community, including members, staff and council. Areas of focus are organizing traditional ceremonies and workshops including sweat lodges, pipe ceremonies and culture camps. Key elements of the visioning session included confirming roles and responsibilities, agreeing on a collective vision, creating a draft work plan, developing principles for working together, outlining objectives for the term and building the team. New Chief Maryann Enevoldsen expressed her gratitude to the Naut’sa mawt Tribal Council (NmTC) for facilitating the forum at which council could bridge and build relationships while bringing them closer together as a team. Maryann was clear in her vision of transparency and wants membership to know what is unfolding during council’s first session together. “The more information our nation has, the more united we will be,” she said. The chief added that this was the first time that the full council had come together since the November election. She said the workshop enabled council to come together as a team while having respect and personal connection throughout the discussions. “It has shown how much we really have in common and how we can move forward,” she said. Traditional teachings were a big part of Maryann’s early years and she said that she wants to reintroduce culture back into the community…“How our ancestors taught us about our culture and beliefs.” Along with those teachings and beliefs, traditional healing and revitalization of culture are priorities for chief and council to initiate for the benefit of the entire community. Other objectives during the three-year term are one-year and three-year plans that include a constitution, bylaws, capacity building and a youth council. It is also important to note the principles for leadership Homalco chief and council adopted. Respect, trust, transparency, community-focus, policies and procedures, accountability and teamwork round out the top priorities. NmTC staff and project managers—Valerie Cross-Blackett, Bronwen Geddes and Eric Blueschke—facilitated the event along with Jessie Hemphill who is the community-planning mentor and peer-to-peer coach for Aboriginal Affairs and Northern Development Canada.